September, 1934 marked the second anniversary of SFD / FM, and the magazine returned to a much more robust 42 pages. 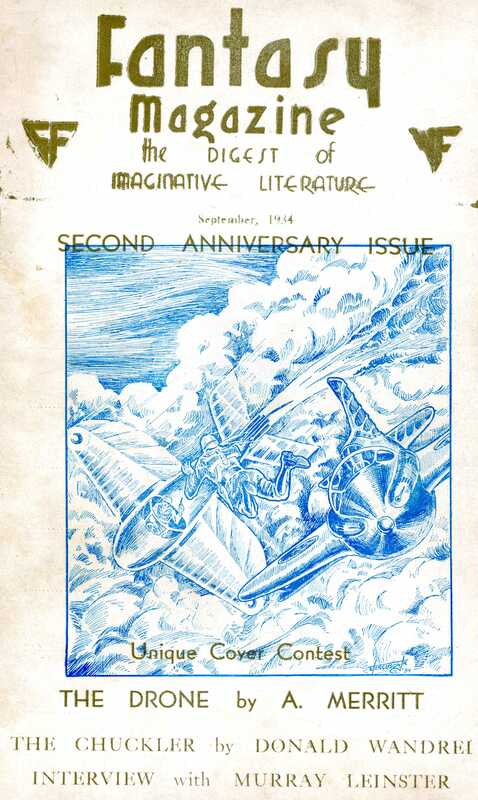 Clearly the the most ambitious yet, this issue featured new cover art with an associated story-writing contest, an exclusive fantasy story by A. Merritt, and additional short fiction pieces along with the usual cast of columns. The Society of American Inventors is seeking a word to replace the “Inventor.” It is felt the word has been overworked and abused. A new one descriptive and emblematic of scientific creative endeavor is desired. “Synthist,” “Creationist,” and “Neotor” have been suggested. Here’s a fine chance for Ackerman and Weisinger to display their word-creating talents to real advantage and perhaps immortal fame. Forrest J Ackerman’s column carried a new name and a new masthead. Forry continued to use variations of this banner in his publications for decades. 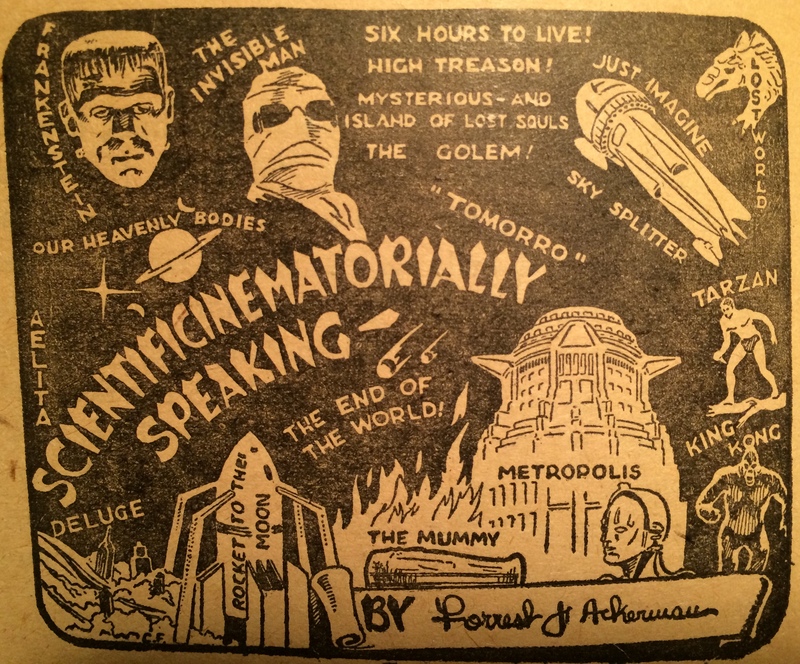 “Scientificinematorially Speaking” this month featured a fully-drawn movie plot entitled “The Cataclysm!” penned by Forry. I don’t believe the outline ever made it to celluloid. 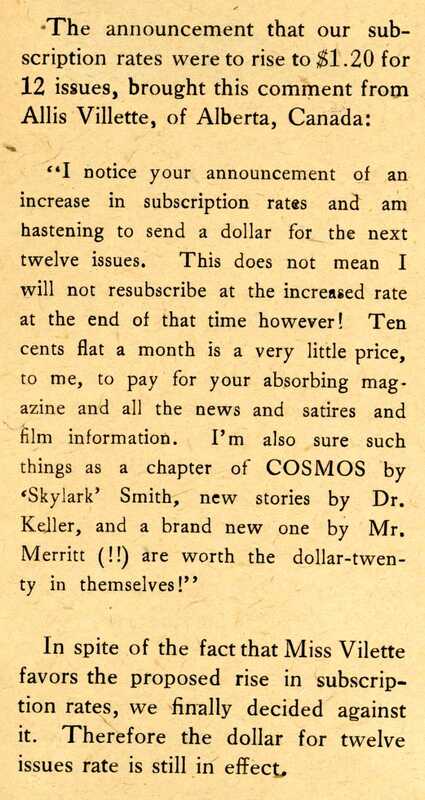 The September issue also featured an ad for another ambitious fan publication. 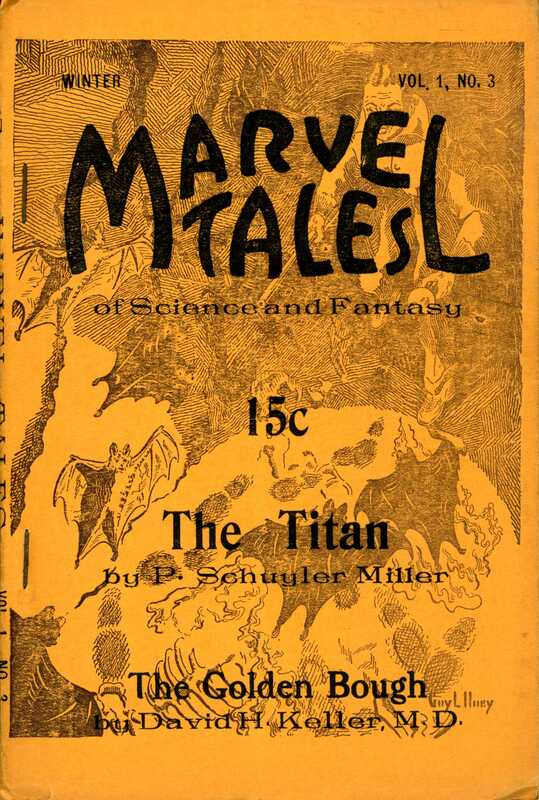 Marvel Tales first appeared in May, 19 34 and ran for just five issues until its demise in the summer of 1935. It published primarily original fiction, including original stories by Robert Howard and H.P Lovecraft. Editor William Crawford aspired to be a book publisher, and is known for issuing the only work of H.P. Lovecraft published in book form during the author’s lifetime (The Shadow Over Innsmouth, 1936). Crawford went on to fou nd the Fantasy Publishing Company in 1946. 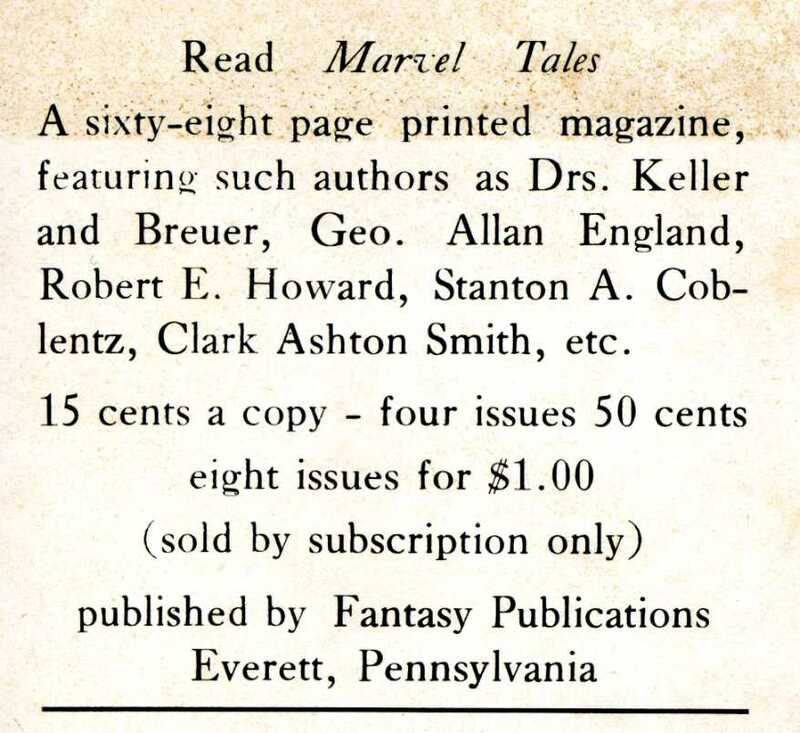 The short history of the ambitious Marvel Tales shows how difficult it was to sustain an audience in the unsettled times, and helps to highlight the persistence and relative success of the men behind Fantasy Magazine. Read about the October – November, 1934 issue.